The Dictionary of Canadian Biography/Dictionnaire biographique du Canada contains a wealth of material on the different peoples who have contributed to the building of Canada. N. E. S. Griffiths’s essay “The Acadians,” published in Volume IV (1979), recounts the early history of one particular group. Her article covers the establishment of these French-speaking settlers in the territory called “Acadie,” the events leading up to their tragic deportation in 1755 and afterwards, and the attempts of numerous men and women to return to the colony. The thematic ensemble presented here is part of their continuing story, highlighting Acadians of the 19th and early 20th centuries. A better understanding of this part of Canadian history can be gained by exploring the lives of those persons whose biographies are listed in each section. Certain well-known figures, such as Senator Pascal Poirier, Bishop Édouard-Alfred LeBlanc, and Premier Peter John Veniot, are absent because their biographies are not yet part of the DCB/DBC. Nor could all aspects of Acadian life be discussed, since this selection includes only the biographies currently within our printed volumes or on our website. In addition, the texts were written over several decades, and they reflect the historiographical assumptions of their period, and the sources that were available to the authors. In 1764 the British government informed Lieutenant-Governor Montagu Wilmot that Acadians, most of whom had been forcibly deported between 1755 and 1762, could return to Nova Scotia, provided that they took an oath of allegiance. Grégoire Trahan and many like him chose not to return. A number of families had escaped deportation by taking refuge in the forest; some of them, including that of Cécile Boudreau, made their way to Quebec and stayed there. Those Acadians who had remained in the colony and those who decided to go back, such as Michel Bastarache, dit Basque, were often compelled to settle on poor soil in isolated areas, since the original Acadian farmlands had been taken over by new, English-speaking colonists. Thus, “Rebuilding” constitutes the first theme of this unit. 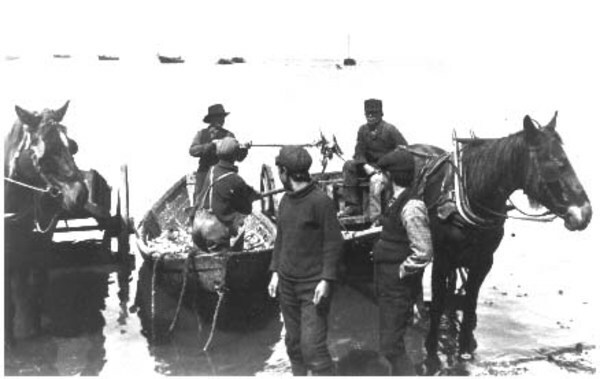 In their far-flung communities most Acadians eked out a living through farming and fishing on the fringes of the Maritime economy. “Economic Adaptation” illustrates later attempts to move beyond these traditional livelihoods and to explore new industries and various possibilities. The Société l’Assomption, a mutual-benefit society of which Rémi Benoît was the first president, was one of these initiatives. As N. E. S. Griffiths points out, religion played a more important role in post-deportation Acadian society than it had in the past. Initially, many of the Roman Catholic clergy and religious came from outside of the Maritimes, usually from Quebec or France, but as local populations grew and educational opportunities became available, Acadian men and women found vocations in the church. While some chose to play purely spiritual roles, others cared for the sick and needy. Those who were active in education, politics, and economic pursuits and those who provided guidance and inspiration during the Acadian renaissance occasionally found themselves in conflict with their church’s anglophone hierarchy. A small number of figures, including Philéas-Frédéric Bourgeois, appear in several parts of this ensemble but their roles as “Religious Leaders” are explored here. For many, the availability of French-language education at all levels was crucial to the survival of Acadian identity and culture, as illustrated in “Elementary Education in French” and “Higher Education in French.” Laypersons, including parents, teachers, and school inspectors, were prominent in the struggle at the elementary-school level, urging the development of appropriate teacher-training facilities and textbooks. They were, however, sometimes divided over the question of religion in schools. In Caraquet, N.B., during the 1870s Juste Haché and a few others favoured tax-supported non-denominational schools that would educate Catholic and Protestant children together, while many, such as Théotime Blanchard, protested the government’s failure to fund sectarian schools. In the battle for secondary and post-secondary institutions that would meet the needs of Acadians, the clergy played a leading role. Joseph-Théophile Allard’s efforts to set up a college were particularly notable. By the early 1860s Acadians had become conscious that their increasing numbers allowed them to exert political influence. The advantages of “Political Action” became obvious as the role of the state expanded. Government grants for schools, roads, harbours, and bridges were more readily available and patronage positions were more numerous. Rather than continue to use anglophone intermediaries, Acadians turned to members of their own community, such as David-Vital Landry, to represent them municipally, provincially, or federally. Although the Acadian identity was deeply rooted in history, the leaders of the 19th and early 20th centuries knew that they must look to the future. The emerging nationalist movement, one of the most important developments of the period, convincingly demonstrates this recognition. In 1880 about 40 Acadian leaders, including Gilbert-Anselme Girouard, attended in Quebec City a convention of French speakers from across Canada. Realizing that they represented a unique group within the country’s francophone population, they decided to organize their own assemblies and they thus set in motion the rebirth of the Acadian nation. The conventions of 1881, 1884, 1890, 1900, and subsequent years provided a platform for debate on issues that ranged from education to agricultural colonization to the Acadianization of the church hierarchy, and galvanized the community. Participants such as Stanislas-Joseph Doucet argued over the choice of symbols around which Acadians could unite: a national day, a flag, a hymn, an insignia, and a motto. “The Nationalist Movement” offers opportunities for understanding the strategies developed by those who launched it. The biographies presented in “Acadians of the 19th and Early 20th Centuries” provide rich insights into an important period in Canadian history, and we invite you to discover the stories they tell and the broader themes they illustrate.